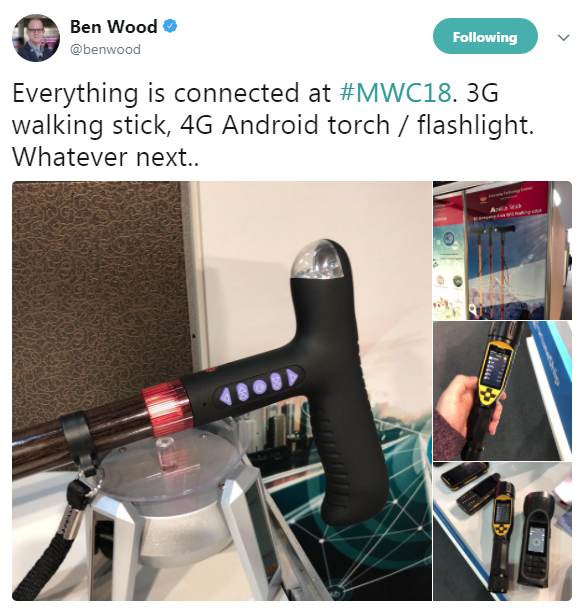 In our fourth and final summary of news from Mobile World Congress, we look at more 5G announcements, flying taxis, communications on the Moon and some of the show's stranger exhibits. In the wake of AT&T's announcement that it will begin deploying 5G in Dallas, Waco and Atlanta by late 2018, Sprint reaffirmed its commitment to roll out 5G in the first half of 2019 in conjunction with Ericsson, Nokia, Qualcomm and Samsung. As an important step toward 5G, Sprint will begin deploying Massive MIMO technology in Chicago, Dallas and Los Angeles with expansion to Atlanta, Houston and Washington DC later in the year. Sprint has a rich spectrum position in the 2.5 GHz band, which theoretically puts it in a strong position in terms of coverage and capacity for both gigabit LTE and 5G services. However, Sprint's financial constraints have meant that network infrastructure has been the primary challenge to date. With a fresh injection of investment from parent SoftBank, Sprint hopes that the transition to 5G will work to its advantage and enable it to finally make the most of its spectrum holdings. However, the capital expenditure needed to establish 5G on a nationwide basis still poses significant questions for Sprint following its failed bid to combine forces with T-Mobile. T-Mobile raised the volume on 5G hype in Barcelona by announcing that it will launch networks in 30 regions in the US in 2018, including large cities such as New York, Los Angeles, Dallas and Las Vegas. Furthermore, building on its strategy of prioritizing coverage by using 600 MHz spectrum, it stated that it will begin deploying millimetre-wave technology to fulfil capacity requirements in denser areas. The carrier remains focused on 5G for mobile services, in contrast to AT&T and Verizon, which are both racing to be first to deploy fixed wireless access networks. Inevitably, there is a marketing spin to this announcement — work will start in 2018 but commercial availability will not start until the first half of 2019, when the first handsets become available. However, CCS Insight believes T-Mobile has a sound strategy that prioritizes coverage, enabling it to quickly build economies of scale and lower the cost per bit. The "30 markets" headline and inclusion of cities such as Los Angeles and New York will grab attention given AT&T's focus on Dallas, Atlanta and Waco, and Verizon's silence on which five cities will host its network launches. T-Mobile has deliberately adopted a very different strategy to the market leaders but the questionable economics and the demand for fixed wireless broadband mean that its focus on building coverage and capacity is once again generating attention and redefining the 5G race in the US. There was a noticeable lack of wearables announcements at this year's Mobile World Congress. Unlike at the previous four shows, no new major Android Wear or Tizen smartwatches were revealed. There were plenty of products from small and hopeful new entrants, clearly attracted to the space by the success of the Apple Watch and burgeoning sales of smartwatches for children, especially in China. Yet they failed to inspire, bringing no innovations to the market. We expect significant smartwatch news and developments at Baselworld in March. 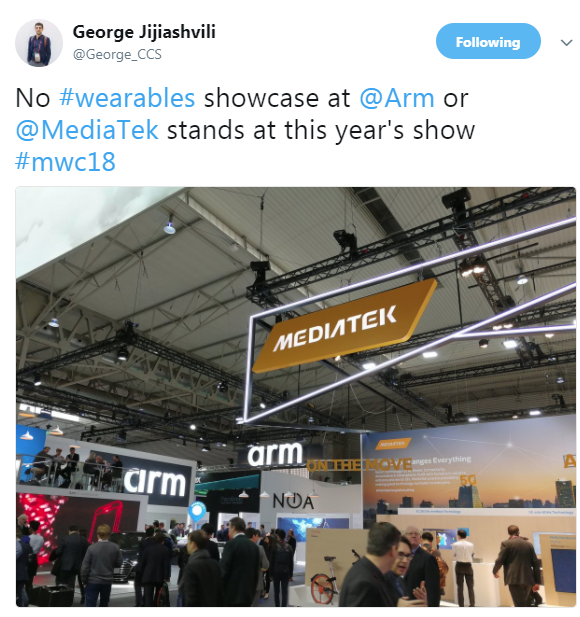 We believe they will signal the shift of the wearables market, especially smartwatches, away from the cradle of smart devices and closer to the home of watches. Just before Mobile World Congress, Intel announced that it will work with Dell, HP and Lenovo to deliver 5G-enabled PCs in time for the fourth quarter of 2019. This is the first commitment from Intel about commercial 5G devices, but it will undoubtedly be compared to Qualcomm's pledge to support 5G smartphones in early 2019. Qualcomm is unquestionably in the stronger position as the industry transitions to 5G. However, comparison of Intel and Qualcomm invariably focuses on the modem and ignores Intel's broader strategy, which spans from the cloud through the network and down to the device. We fully expect Qualcomm to dominate the first batch of 5G smartphones, but this announcement is nonetheless an important one that highlights Intel's progress. Smartphone design wins beyond the iPhone will take time and ultimately require an integrated system on chip. The 5G community will be keen to see a diversity of suppliers as the industry threatens further consolidation. Intel is making steady progress in a 5G race that is very much a marathon rather than a sprint. Dubbed "virtual fibre", the tests are taking place in Berlin and Budapest and utilise millimetre-wave spectrum. The move is seen as a cost-effective alternative to full deployment of fibre networks, with the added benefit of being faster to deploy. 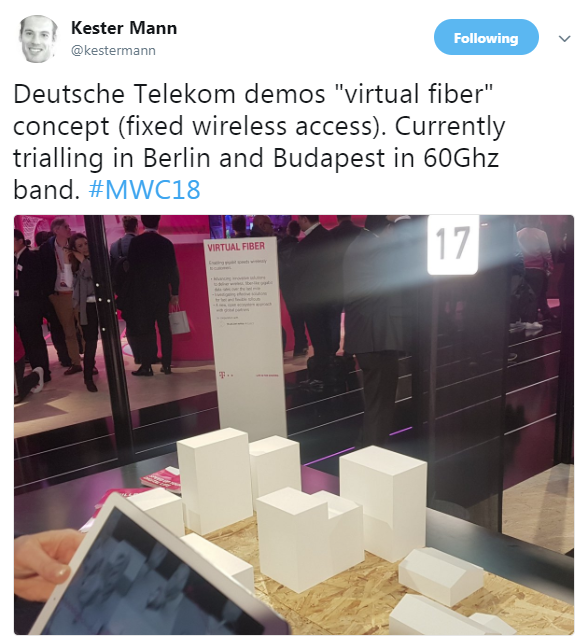 Deutsche Telekom's tests follow an announcement by Orange earlier in February 2018 of 5G fixed wireless trials in Romania in conjunction with Cisco Systems and Samsung. The initiative aims to create communications infrastructure for future lunar missions. It is part of a project by Berlin-based company PTScientists that will represent the first privately-funded moon landing. 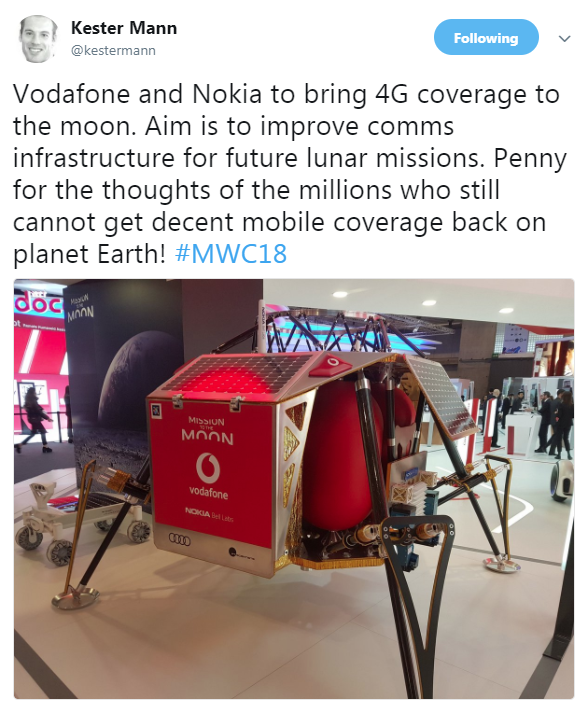 Vodafone claims that the new technology will help preserve energy as mobile signals are more efficient than the analogue radio methods used on previous missions. However, while the prestige of enabling extra-terrestrial coverage will gain those involved some marketing kudos, some customers may question whether the investment would have been better spent bringing mobile signals to not-spots back on planet Earth. 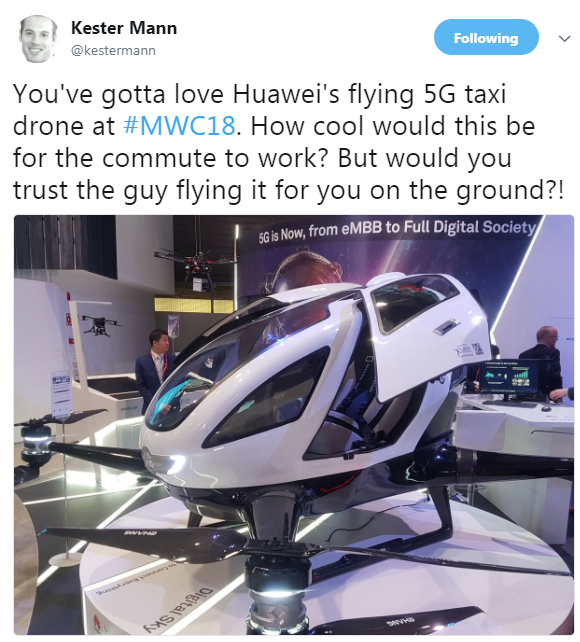 Huawei demonstrated a futuristic 5G-connected drone taxi. The machine shown at Mobile World Congress has performed only a short round trip of 200 metres in China, but theoretically it can carry one passenger of up to 120 kg for 41 kilometres. It can fly at a speed of up to 160 kilometres per hour. Currently it has to be controlled by a human, but in the future it will (of course!) be autonomous. Although we can think of a lot of limitations, including the obvious ones of flying restrictions, compliance with aviation rules, and the safety risks, it is clear that the future will bring a lot of new exciting technology into our everyday lives. A regular commute to the office in such a drone is way out in the future, but the machine demonstrates the far-reaching implications of 5G and further generations of connectivity. Above all, it illustrates Huawei's serious ambition to be a leading infrastructure provider for 5G and beyond. An eye-catching collection of weird and wonderful technology is present at the show, as always. This year, we wonder whether we've now seen it all: a watch with a built-in projector; a prototype of a smartwatch that packs all possible wish-list features like facial and iris recognition, a fingerprint sensor, a SIM slot and Android 7.0, but not in a working sample; an accordion-design virtual reality headset. Of course, we shouldn't dismiss all these ideas indiscriminately: there was a time when the idea of carrying a phone everywhere with you sounded bonkers too!